Model 3121 square concrete pedestal drinking fountain includes a polished stainless steel basin, push-button operated stainless steel valve with front-accessible cartridge and flow adjustment, 100% lead-free waterways, polished chrome-plated brass vandal-resistant bubbler head protected by a hood extension, polished chrome-plated vandal-resistant waste strainer with top-down clean-out access, integral mounting feet, vandal-resistant stainless steel access plate, and 1-1/4" O.D. tailpiece. Haws manufactures drinking fountains, electric water coolers and electric drinking fountains to be lead-free by all known definitions including ANSI/NSF Standard 61, Section 9, California Proposition 65 and the Federal Safe Drinking Water Act. 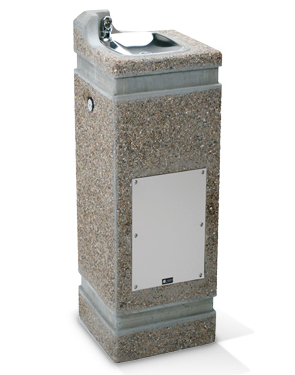 Square vibra-cast reinforced concrete 100% lead-free pedestal drinking fountain with exposed aggregate finish. Polished chrome-plated forged brass, integral basin shank, shielded, anti-squirt, vandal-resistant bubbler head. Stainless steel push activated valve, front accessible for stream adjustment and servicing, replaceable pressure regulation control cartridge, with an operating pressure range of 30 to 90 psi. Polished chrome-plated brass bubbler head features an integral basin shank, and is equipped with a shielded, anti-squirt orifice. Top-down access to the drain allows the fountain to be cleaned without taking the unit apart.